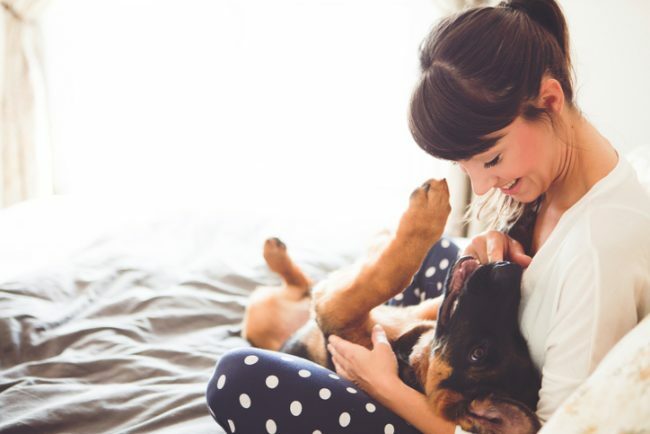 Decorating your home is a fun, creative, and expressive process of putting yourself into your living space — but what about the furry members of your family? When laying out and decorating your home, there are some key elements that you can slightly alter or improve to make your home more pet-friendly, durable, and easy to keep looking and feeling fresh. Not only will you benefit, but your pets will feel more at home too. Here are some ways to make your home design pet-friendly. Skip the wall-to-wall, expensive carpeting. Skip the softwood floors, no matter how beautiful. Both of these floors will quickly show the impacts of life with pets, either when they are covered in hair or are scratched up by little claws. Opt for ceramic tile in your most high traffic areas, like entryways and main rooms, and consider hardwood floors or even sealed terrazzo (kind of like concrete) elsewhere. Just remember that large dogs can still scratch hardwood, so maybe reserve it for bedrooms if your pup will leave a mark or add area rugs to cover a lot of the surface area. Word to the wise on those rugs? Don’t spend too much on them. No matter how diligent you are about cleaning them, once your pet has lived on them, they will never be the same. Whether you allow your pets on the furniture or not, their fur will find a way. Choose furniture with upholstery that is stain resistant and easy to clean — bonus points for couch cushions with covers that can be removed and washed. Leather or pleather couches won’t get covered in fur, but they will sustain a few scratches from puppy and kitty claws so don’t get too attached. Many furniture lines now make models with fabrics explicitly designed to be pet-proof…which might be worth the extra money in the long run! If you are a dog parent or have an outdoor cat, you need to deal with the comings and goings — and the stuff, dirt and debris that comes along with it. Make an area to hang leashes and other accessories for Barky, put a high-impact floor mat down to catch the muddy paws before they hit the clean floors, and consider even half-tiling the walls to prevent stains from the inevitable shake-off. Add some shelving and storage for treats, towels, and other knick-knacks, and your pet area will be well-stocked. Set your pet up for success: don’t leave your vintage collection of Beanie Babies at snout level, or decorate with knitted animals or felted things. Your pets will naturally assume you’ve left toys around the house, and you will be sad when they are chewed. Likewise, animals don’t always know which plants are and aren’t safe for nibbling. Have a look at the ASPCA’s list of toxic plants, and keep them out of the house for your pet’s wellbeing. Since you also want to avoid having to wrestle your decorations out of a puppy’s mouth, keep small items in a china closet or other enclosed area. If you’ve ever had the brilliant idea to give your dog a rope indoors, you know: one messy toy can leave residue for a long time. If you are a fan of marrow bones or other food-like treats, do yourself a favor and leave them for outside time only. Rawhide really isn’t great for your dog anyway, but it will be guaranteed to make a mess of your floors. When giving your cat a catnip ball, choose a contained area so you don’t end up with flakes of catnip everywhere. Fluffy may not love being groomed, but it will help keep the fur levels down. For dogs, depending on their hair you may bathe them at home or choose to bring them to the groomers. Either way, prevent your home from getting a film of animal dander and grease by keeping their fur clean. Tip: use a gentle, natural shampoo to prevent creating more dandruff! Unpakt is a full-service, online moving platform that can help easily plan, compare, book and manage a move.